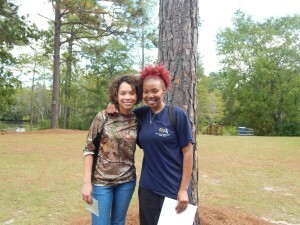 UNC-Pembroke environmental studies students Carlisha Hall and Catheryn Wilson discuss what people can do to help the environment. CW: I’m an environmental biologist because I look into how not just the environment affects the animals or affects them based on what’s going on, but how are we doing. So we can recycle a little bit more. We can, oh let’s go ahead and use reusable bags – you know, simple solutions that really do make a big change and really help to preserve what we have. CH: Yeah, there’s so much we can do – just one person saying, “Hey, pick that up. Toss that in the trash,” you know. There’s so much we can do to help our environment or to make it better, because if we don’t, this is all we have.